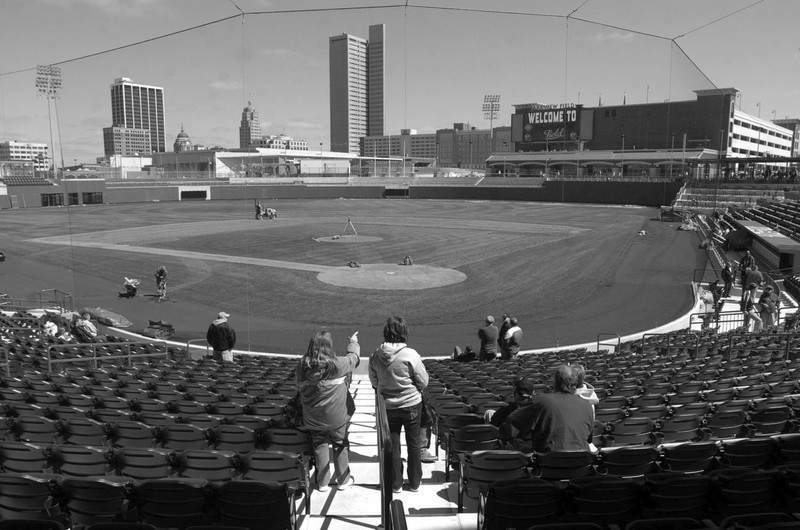 Fans check out the view of downtown during the Parkview Field open house, Saturday. Residents of Amarillo, Texas, are debating a proposed downtown ballpark, which prompted columnist Jon Mark Beilue of the Amarillo Globe-News to take a look at how an earlier debate played out here. "Man, we heard it all," TinCaps General Manager Mike Nutter, tells Beilue. "But we just kept staying the course, kept believing in what we were doing. We knew it had been successful in other cities, and that it could be here." The column describes the $130 million project that included a downtown stadium, convention hotel, parking garage, and a four-story residential and commercial complex. "If this sounds familiar, it should – right down to the push-back," Beilue wrote. "Amarillo’s proposed $92.5 million downtown development projects follow the first three components of convention hotel, parking garage and stadium. "By any reasonable measure, the Harrison Square project was not an end-game, but a game-changer, a catalyst for Fort Wayne that by itself has worked, but has also spurred hoped-for additional growth in what is the economic danger zone for many American cities – downtown." In addition to Nutter, the Texas columnist interviewed former Mayor Graham Richard, city spokesman John Perlich, Community Development Director Greg Leatherman and a representative of White Lodging, operator of the Courtyard by Marriott. "It’s been incredibly huge," Nutter said of Parkview Field, "and I’m not a guy who uses hyperbole. But I can’t overstate it. There’s a synergy, a nostalgia, about having a stadium, an outdoor community gathering place, in the heart of the city." Beilue noted the 1,662 non-baseball events booked at the stadium since it opened and the success of the office, retail and residential project in The Harrison, as well as the hotel’s success, with Leatherman noting there is discussion of adding 100 rooms there. The column also points to continuing development in Fort Wayne – the Ash Brokerage project and Cityscape Flats. "Would Amarillo experience a similar upsurge, scaled back to match the population density?" Beilue asks. "Or would it be a white elephant?" "All I can tell you is what has happened here," Leatherman replies, "and the short answer to all of this is the business community in Fort Wayne knew what was at stake, and we couldn’t be happier with what has been generated as a result of the Harrison Square project."